Holy snow! Boy oh boy, did it snow! 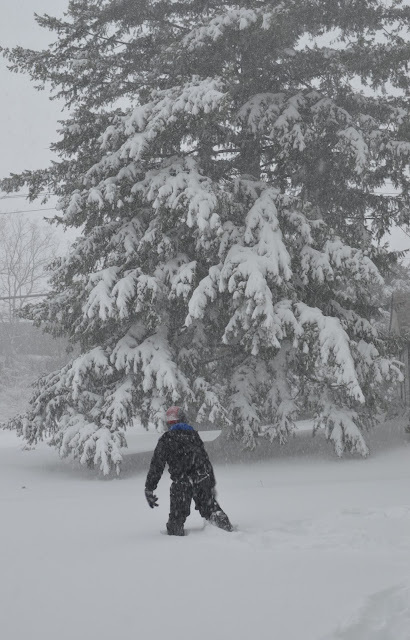 We got walloped with more than 2 feet of snow this past weekend. I hope this means we're done for the season (wishful thinking, most likely) but I'm just grateful that we didn't lose power and everyone is safe. We had plenty of notice about the blizzard so we were prepared. And a big part of storm preparedness is obviously, food. Everyone gets incredibly hungry on snow days, I've noticed. So I started Saturday morning with something decadent - monkey bread, a mini version. It's Chinese New Year in a couple of weeks and it will be the year of the monkey. That got me thinking about monkey bread. It's a stretch, I know, so I'll just admit it was an excuse to try monkey bread, something I'd never had before. I wanted to make a mini version for my family and that's just what I did on Saturday. A snow day was the perfect setup for a decadent sweet breakfast, which can be rationalized by all the impending exercise from snow shoveling to come. I adapted this recipe from Dessert for Two but instead of making 4 muffins, I baked it in a single large (about 16 oz. capacity) ramekin. I know monkey breads are usually made with either a biscuit or yeast dough; this one is made with a simple homemade biscuit dough. While I'd probably prefer the yeast variety, the biscuit dough is easy to make and, I think, more suited for a small scale recipe. My family and I didn't really know what to expect from this little monkey bread but everyone enjoyed the individual little balls of warm biscuits, coated in sweet cinnamon-caramel. I think the little one was pleasantly surprised. And do you see that white glare in the background of the photo above? That's the snow pile at around 9am on Saturday morning. It just kept on falling and falling, relentlessly, and by that evening, we had a good 2 feet of the fluffy stuff on the ground. And the correlation between hunger and a snow day is very real. The fellas had no problems devouring their first monkey bread breakfast and they seemed hungry every hour or two. Needless to say, we went through a good chunk of groceries over the weekend, and I'm off to replenish our stock! 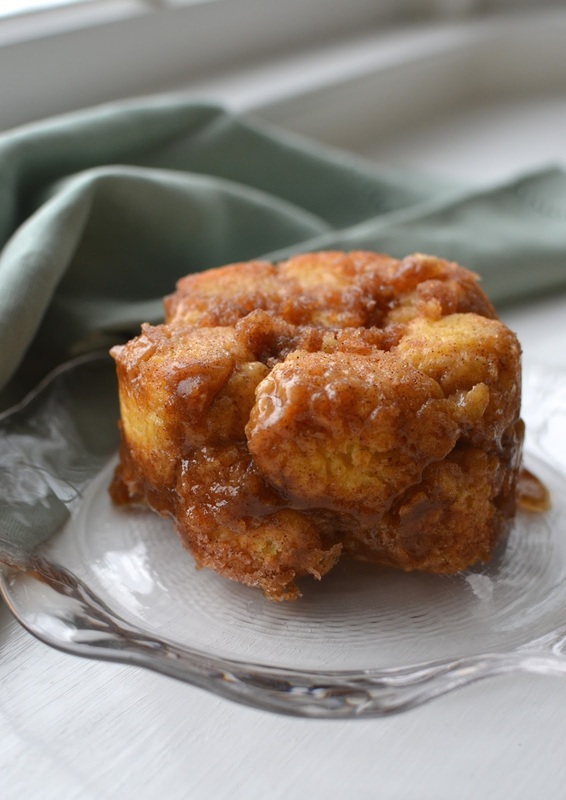 For this small batch monkey bread, you start by making a basic biscuit dough. The recipe I used called for a mix of butter and shortening. I substituted the shortening for more butter since I don't have shortening on hand. I rolled the dough into little balls, about an-inch or so in size, then rolled them in cinnamon sugar. I considered using muffin tins and even my mini bundt pan but decided to plop the biscuit balls into a large ramekin. It seemed the easiest thing to do and a fun breakfast to share with my family. Now that I've baked mine, I can see why many monkey breads are baked in a bundt pan. I think the shape helps the dough cook more evenly. Even though the caramel was bubbling and my mini monkey bread looked done around 15 minutes, I found it took closer to about 25 minutes for all my biscuits to cook through in the ramekin. I let it cool a few minutes out of the oven and then crossed my fingers to invert the monkey bread onto a plate. Each little bite you pull away is a mouthful of crusty sweet cinnamon-sugar doused biscuit. I get the hoopla about monkey bread now. My husband did most of the work so it's a good thing he had a good share of this mini monkey bread. Eating is like a sport on snow days and we ate a lot this past weekend in general - we needed every single bite to shore up our energy for all the snow shoveling! Preheat oven to 375 degrees. Lightly butter a 16-oz. ramekin and set on top of a baking sheet. In a small bowl, stir granulated sugar and cinnamon together. To make biscuits, whisk flour, baking powder, baking soda, and salt together in a medium-size bowl. Add cold butter pieces and blend them into the flour using a pastry cutter or your fingers until the butter has been well incorporated into the flour. Stir in the milk and mix until a dough just forms (avoid over-working the dough). Take a pinch of dough and roll it into about a 1-inch round ball. Toss it thoroughly in the cinnamon-sugar and drop it into the prepared ramekin. Continue with all the dough. You will have some remaining cinnamon-sugar, which you can pour on top of the biscuits (all of it or if you feel the need for some restraint like I did, toss in as much or as little as you see fit). Make the syrup by melting the butter, brown sugar, and cinnamon in the microwave. Stir together and pour the mixture over the biscuit dough in the ramekin. Bake until biscuits are cooked through, about 25 minutes (you might want to take the monkey bread from the oven and carefully remove one of the center biscuits with a little fork to check for doneness - just remember the caramel is very hot!). Carefully remove the monkey bread from the oven. Let cool a few minutes, then run a knife around the sides of the ramekin and then carefully invert it over a plate. Serve warm. 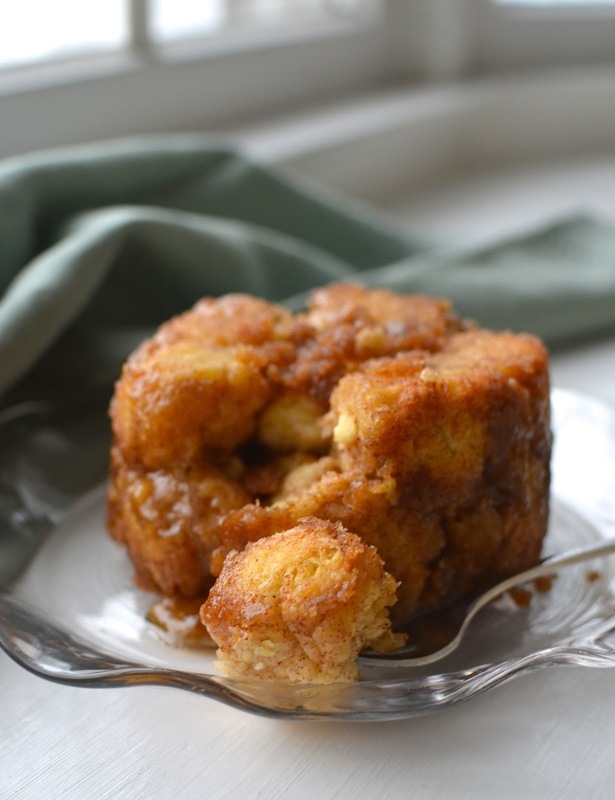 I have never made monkey bread and I am sad to say I've never even tried it! It's probably a good thing - because I know I would love it. You got more snow than we did, but I have the sore muscles to prove we had plenty :) It was crazy snowing from Friday at noon and it didn't stop until the early morning hours on Sunday. We did our share of eating but I wish I had thought of this - it looks delicious! Good idea to make a small batch. So happy everyone is safe. Enjoy! I had never made/eaten monkey bread til now. I'm really curious to try a yeast version but I'm not sure when/if that's in the cards. You know all that sugar had to go somewhere and I think all that hardy snow shoveling was the perfect way to expend it. ; ) Glad it wasn't too insane for you...stay warm and cozy! How adorable! And I presume this prevents overeating?? But probably not because I would just have more than one of these :) It's so hard to stop eating monkey bread! Looks incredibly moist and delicious! Definitely worth a try! Thanks! Glad you guys didn't lose power! My parents live in NJ and got completely slammed too! I think they finally were able to get out today! I love the idea of mini monkey bread - sometimes I just want a little bit and not a crazy amount for the two of us! Slammed is the right word! And we thought the idea of 12 inches was bad. It just kept falling and I was starting to feel claustrophobic! The little monkey bread went quick on blizzard day and the fellas were hungry all the time! we never made monkey bread, but my friend brought over some a few months ago and it was really good. Glad to hear everyone is safe from the snow storm. All that caramel makes it hard not to like, I think! ; ) Thanks - I'm glad that storm is over! He was especially hungry on Saturday - must have been storing up for all the snow shoveling Saturday night and Sunday! I'm glad I mostly "work" in the kitchen! Hi Monica, it sounds like sonow days are a wonderful excuse for you all to hang out together. 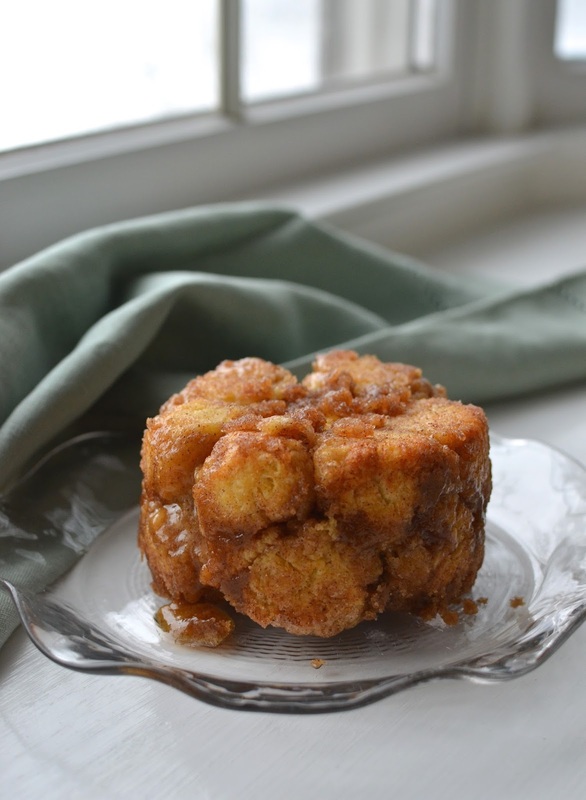 Your baking even makes it better, love this mini monkey bread. We definitely try to make the best of a snow day. It's lovely when it's falling and you're snug at home...then you have to face the shoveling! What a brilliant name, never heard it before and what a great recipe after a snow day. It looks so good. Oh my goodness! I'm so glad you guys didn't lose any power! Surprisingly, we didn't get hit with any snow but I now it's only a matter of time. Love that you made mini monkey bread! I've always wanted to try and mini ones are so much more manageable for our little family too :) It looks so so adorable and delicious! Hope you guys stay safe and warm! It's wild how much we got and the city, too. Luckily, it's about 40 degrees so far this week so melting going on...hope we won't get anything like this again this year! 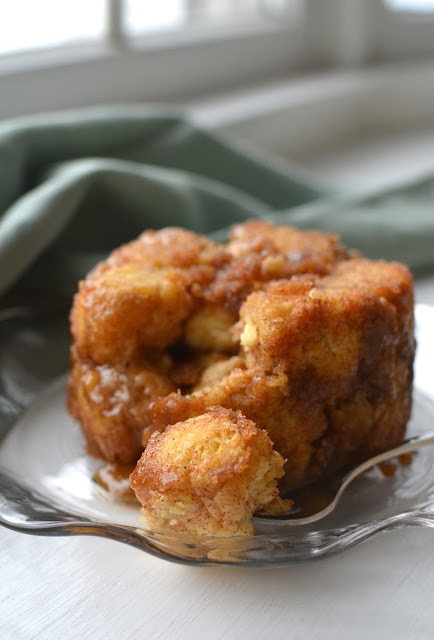 I love monkey bread, this looks so delicious! What else is there to do during a snow storm but to eat this yummy monkey bread? I bet it disappeared in seconds! Definitely making the most of it - winter can be rough and gotta keep your face to the sun (when there is any!). : ) I do enjoy the sticky appeal of monkey bread, Juliana. Two feet of snow?! That's crazy! I hope these warm you right up! They look perfect for an under the cover treat. We needed a lot more than the mini monkey bread but it was a start! : ) Thanks, Jessica. Hope all is well. Oh it all sounds so exciting for someone who's barely seen snow in her life. I am sure it's a lot of work but it looks so pretty!Your mini versions of desserts are brilliant. This is no exception! The size of this monkey bread is just right. Not too much for 2! Warm and sweet bread for winter. Hehe I was on the same wavelength with the monkey bread especially as my mother has been asking what I am making this year! It's so addictive isn't it?